100Gb to the farthest reaches of MN. CNS’s wholesale IP and TDM transport services connect Minneapolis, Fargo, and Duluth to the most rural portions of the state. Wholesale Internet, and MICE Gateway connectivity is available at the 511 building in Minneapolis. Leveraging Cisco’s ASR 9000 platform, ROADM, SONET, IP-MPLS and L3 services transport a wide variety of protocols including T1, DS3, OCx, DWDM windows, Ethernet services, MPLS and Layer 2-3. Wireless carriers, financial institutions/banks, healthcare providers, telephone companies, broadband ISPs, government agencies, and more trust our fiber network and management experience. This powerful, flexible network connects communities including Brainerd, Grand Rapids, Bemidji, Moorhead, Wadena, Fergus Falls, Alexandria, St. Cloud and Minneapolis. 100% of the network is diverse routed and ring protected using the latest generation of ROADM, MPLS and SONET technologies. The ROADM network includes 40 windows capable of transporting 100Gbps. Operating on the ROADM equipment are fully redundant OC48 SONET and state-of-the-art 10Gbps IP-MPLS systems, both operating with sub-50ms failover recovery. The flexibility of the ROADM network allows for quicker turn-up, faster trouble resolution, and the ability to use multiple services over one pair of fibers. CNS has POPs in the major metro areas, and with the help of our owner-partners, our network covers a vast footprint of outstate communities and rural areas that other carriers simply cannot reach. CNS’ network meets the stringent technical requirements for backhaul of the major national wireless carriers, for latency, jitter, throughput, recovery time, up-time, diverse paths and redundancy. These same high standards for performance and quality are inherently available to all customers who utilize the network. This access is supported 24/7/365 by local and regional NOCs. 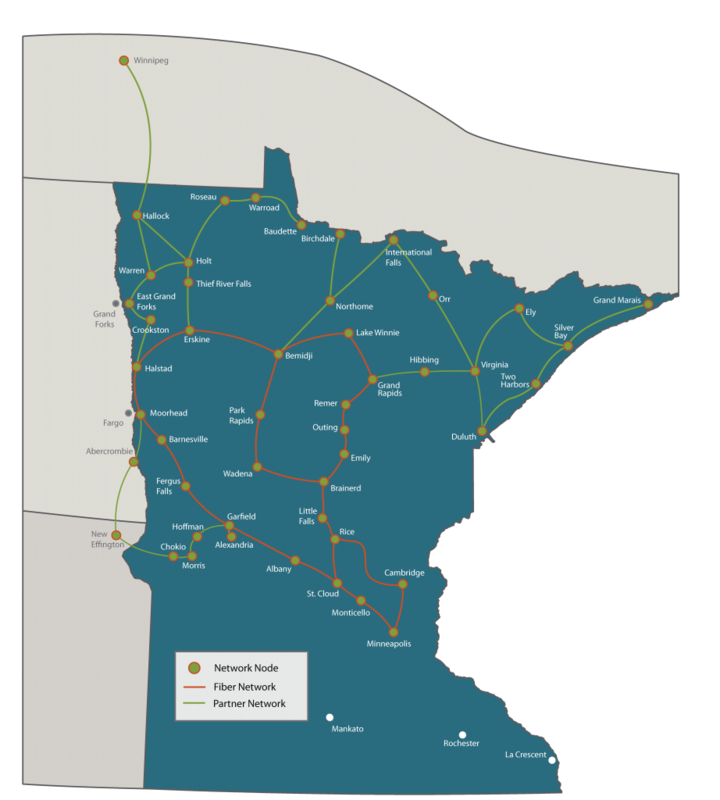 If you’re looking for ethernet, MPLS, or any point to point, or point to multi-point service from Minneapolis or Fargo to Brainerd, Bemidji, Wadena, Little Falls, Rice, Fergus Falls or other northern MN towns, CNS can help.